We interviewed every family at T3 today (the new transit camp where most of the refugees from KM18 have now been transferred). I still can’t believe this band of hardy outreach workers managed to carry out about 2000 interviews in one day. They are so motivated. We interviewed every family at T3 today (the new transit camp where most of the refugees from KM18 have now been transferred). I still can’t believe this band of hardy outreach workers managed to carry out about 2000 interviews in one day. They are so motivated. 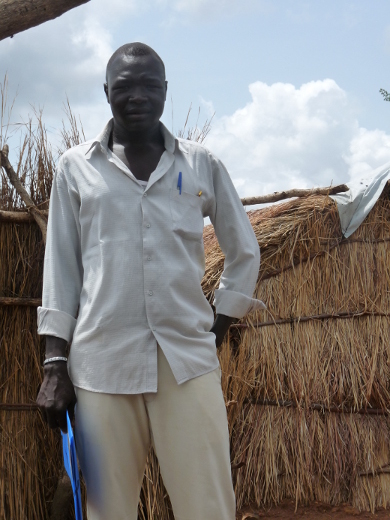 Half of them come from Blue Nile state and fled the same violence. They want to be here, to help in some way. And the other half of the team, made up of local residents, want to be here too. Over the last few days we’ve been taking well-deserved breaks together, drinking the local spicy coffee at the market and sharing stories. We discovered that we have 3 doctors on the team; Mohammed Issa with the claw foot, Jilail the eldest in the group and Mr Cool, Abdul Aziz. But of course they don’t have their certificates or any kind of proof so have to take any work they can. Also Abdul Aziz is a bit of a musician and is in a band that we’re hoping will perform on my last day here. But the most poignant moments have been when the teams have talked about fleeing Blue Nile state. Arun talked about losing his father and now becoming the man of the house, so much responsiblity for someone so young. Khamisa talked about leaving her husband and family behind, not knowing what’s become of them. Osman and Abueila and Hasson Mohammed talked about the day the bombings started, the second day of Ramadan. Even shy Asha and super-shy Amna became animated when everyone talked about that day. And the local team members have asked lots of questions, keen to know what had happened. I didn’t understand much of what was said. They all speak a mix of Arabic, Ingassana, Magajan and other more obscure languages. Yet they are all translating for each other, ensuring nobody is left out. It was exhausting work today. T3 looks like a major village now. About 7000 refugees were transported in 1 day yesterday. Astonishing as usually the maximum was 2000. But again there was a storm last night and half of T3 became a swamp. People had moved to higher ground which meant we were walking large distances to find them. It also meant they were moving a long way from the latrines and water points. Almost everyone was collecting dirty swampy water into jerry cans. No wonder we are seeing so much diarrhoea. But what choice did they have? Walk for miles carrying heavy jerry cans from the nearest water point, or collect water from outside the tent?